It was twilight on a recent Saturday at the Freshia Market in Tustin. We were there to do some grocery shopping, but what I saw in the parking lot stopped me in my tracks, as if an alien spacecraft had just landed at my feet. 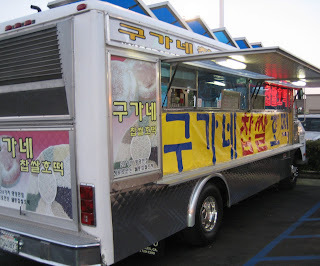 It was a catering truck, plastered with bold Korean lettering and indeterminate photos of something that looked edible. Whatever it was, I knew I had to investigate, and I had to do it now before it left for its home planet, never to be seen again. Ooh look! Let's go try it. We'll just buy one and take a nibble. It's a roach coach, and you can't read Korean. Whatever it is, I'm sure it'll be good. C'mon! I stepped under the trailer's canopy, craned my neck and stood on my tippy-toes to peer inside. The interior was brightly lit, not unlike the beam of light emitted from the bottom of a flying saucer -- the very kind that levitates unsuspecting humans from their beds. In the tiny space, a middle-aged Korean woman flipped unseen objects on an unseen griddle hidden from my line of sight. There was the sign in front of me, which said that whatever they were selling, it was sold for a dollar each, or $10 for 11. When the woman turned to look down from the low crack of the truck's open window, I said, "One please" and surrendered my dollar bill. She had no idea that I had no idea what I just paid for. In return, she passed me what looked like a Chinese onion pancake on a paper plate. "Careful! Hot!" she warned. And she was right. The pancake was almost radioactive. I took it back for us to eat near a row of Korean newspaper boxes, using them as an impromptu table. We each took a bite and immediately fell into a blissed out state. Our teeth met a crisped, brown outer crust, leading to a chewy, almost glutinous, doughy center. Tucked in the middle, sandwiched between it all was a pleasantly sweet but scalding filling of syrup made from brown sugar, cinnamon and a few specks of nuts and sesame seeds. It occurred to me right about then that this is essentially a dessert pupusa. I find out later, by way of Google of course, that what we ate was hotteok (pronounced ho-duck), a common street food found in Korea. And here was a truck selling it on the streets of Tustin. After we polished off the one we bought, I was hankering for another. You wanna share one more? Yes, hotteok! When I was in Andong, South Korea, a couple of years ago, I always went to the resident hotteok cart across from the train terminal. It was soooo goood! And rather reasonable at around $0.30 each. A UFO sighting AND you have pictures to prove it;) Great, and original, review! I wonder if there are more instances of these Korean roach coaches. And was there more than just hotteok? They've been selling this for a while (about a year) on Saturdays. But, it used to be a small little cart tucked underneath the overhang behind one of the pillars next to the entrance, so it was hard to see unless you actually walked near the entrance. I guess they've upgraded to truck status. You are right about the radioactivity, though. thanks for the heads up - I live down the street and will be sure to go over on a saturday afternoon and get one! Sound like my wife and I.
I knew that I saw this on DG's blog before! I wonder if it's the same company? Cool! Right by my house, gotta get this one of these Saturdays. That looks delicious!! I'm thinking of wandering the streets of Tustin 'til I find that truck! If you like the desert pancake but don't want to buy from a roach truck, go to Zion Market in Hawaiian Gardens on weekends. They have a couple of guys making this from a gas grill just inside the supermarket. YUM YUM YUM! That looks like my fantasy dessert come true- wow. Good instincts to get one- nice payoff too. I'll make sure to get the 11 for $10 if I ever get lucky enough to see that truck. Looks yummy. Love your site! btw, that hotteok-truck is very elusive. i saw it in front of the Korean market in artesia and never saw it again. i guess it makes a tour around the different markets (same hotteok-truck). momopi, i had the one in Zion Market in hawaiian gardens... not as good. it's too doughy and not as crunchy. also, the outside box says "anniversary special" so it might not be around for too long (speculation). That's one way to make hotteok even more delicious: a favorable exchange rate! It seems that hotteok is the one and only item they sell. Good thing too! It was easier for this non-Korean to order and not look stupid. 28 kinds of nutritional ingredients eh? I'm happy with just the ones I can count: oil, rice flour, cinnamon, brown sugar, sesame seeds, and nuts. Happy hunting! I hope it makes an appearance when you visit. If not, there's still many goodies to be had inside the market and its food court! Thank goodness for the patience of women! I wouldn't be surprised if it is. Christine below made me aware that a fellow blogger wrote about them over in Koreatown. I hope they make their weekend visits a habit. WOW! I even made a comment on DG's post. My memory failed me when I wrote this post that DG tried them two years ago. Gonna put a link on my post. Thanks! I'd sooner follow this truck than one that sells ice cream! Cool tip! A permanent stall that does it. But really I like roach coaches. They take me back to the street vendors in Indonesia, and the fun gamble of it all. Will I or won't I get food poisoning?! HAHA! I think I can probably eat two in one sitting. Four if I had a a nice tall glass of cold milk. So 11 with a few friends at your side is totally doable! Aha! So it wasn't a figment of my imagination! LOL! Thank you! I'll be here all week. Try the veal. So it was a lucky sighting on my part. Thank goodness I had my camera or no one would've believed me. Hey Elmo - Better keep those Mercury Insurance people away from it...they may say it's the work of Mercurians... Do me a favor, high-jack that baby next time you see it....San Diego is only 70 miles South! Too bad they didnt' have kalbi tacos haha. I just passed by a Freshia Market when I was down in OC, is it nice inside? I wanna try it! Life in So cal....wonderful, huh? All the food finds we have available to us! Dessert pupupas, hard to beat that combination. By the time I get the hotteoks down to you, they should have cooled enough for human consumption. Well, I've only seen this truck once, so apparently they get around! Maybe they can drive to wherever you are! No place in Hawaii has this?! Surely you jest! I take no responsibility for the whereabouts of that truck! HAHA! I would've been happier if it were kalbi tacos. But you would've been the first person I'd call and say "You'll never believe what I found!" Freshia is nice! Was there last night. Got some samples, brought home more banchan for dinner. Nothing nicer than not having to cook after a long day. You said it brother. If only a Mexican taco truck owner married a Korean hotteok maker. Tustin continues to amaze me. So much good eats! Yup! Better than those ice cream tacos in my opinoin. As soon as I saw the photo, my thought was "pupusa." Yum, that sounds really awesome. I don't live anywhere near Tustin, but I work somewhat nearby on Saturdays. I may have to take a detour. Hope it's there when you get a chance to check it out. So far it's been as elusive as Elvis. I'm Korean, and even I was kind of 'jeez... in a truck?' when I saw it. I had one in my car, and was so incredibly happy, I almost did a u-turn to get more. I think it may only be there in the summer, though. Not 100% sure. I've been hankering for one since that day. But I've not seen the truck since. Do let me know if you see it again. I'm so sorry to hear about that. I hope you get to try these hotteoks...I *think* they are made from rice flour. By the way, you probably already know this, but the new Whole Foods has an entire section for Gluten Free foods. If you ever go to k-town there's a hotteok truck that's usually there everyday at 5th and Western (California Market parking lot). But good luck finding the same one in Tustin again! I finally got to eat a Hotteok today. ^______^ Thanks for the tip elmo, otherwise I wouldn't have had the guts to even go up to the truck and buy one. It was so yummy! I wonder if its the same family. I've seen pics of the one in Koreatown and the fonts they use for the sign looks identical. I'm glad you got to try it! I've been going every Saturday (if I remember) and yep...enjoyed every one! 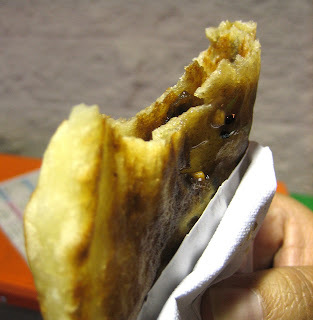 This almost reminds me of martabak.